The United Nations’ special rapporteur on torture has chastised the United States in a new report for being the only country that continues to allow children to be imprisoned for life without the possibility of release. The report by Juan Méndez, the United Nations special rapporteur on torture and other cruel, inhumane or degrading treatment or punishment, singled out the US for its lonely perch as the world’s leading jailer of society’s most voiceless and exposed. “The unique vulnerability of children deprived of their liberty requires higher standards and broader safeguards for the prevention of torture and ill-treatment,” Mendez said. Mendez's report also chronicled the damaging impact that prison – including pre-trial and post-trial incarceration, institutionalization, and immigration detention – has on vulnerable children. “There is widespread agreement among experts that the institutionalization of children contributes to physical underdevelopment, abnormalities in brain development, reduced intellectual abilities and development, delays in speech and language development, and diminished social skills,” Mendez wrote. He said children should always be tried away from the adult criminal justice system. “In addition, laws, policies and practices that allow children to be subjected to adult sentences are inherently cruel, inhuman or degrading because they fail to consider any of the special measures of protection or safeguards that international law requires for children,” he wrote. He added that a life sentence without possibility of parole means life and death in prison, a practice that both international and US law deems cruel and inhumane for children. “Life sentences or sentences of an extreme length have a disproportionate impact on children and cause physical and psychological harm that amounts to cruel, inhuman or degrading punishment,” the report said. Life sentences for children are banned under many international standards, including the International Covenant on Civil and Political Rights, the Convention Against Torture, and the UN Convention on the Rights of the Child – tenets of which the US and South Sudan have signed but not ratified, the only two nations not to do so. A UN committee also found that a life sentence for a child violates the Convention on the Elimination of Racial Discrimination, as children of color are more likely to receive such a sentence than white children. Around 2,500 people in the US are serving life sentences without parole for crimes committed when they were children, according to the Sentencing Project. 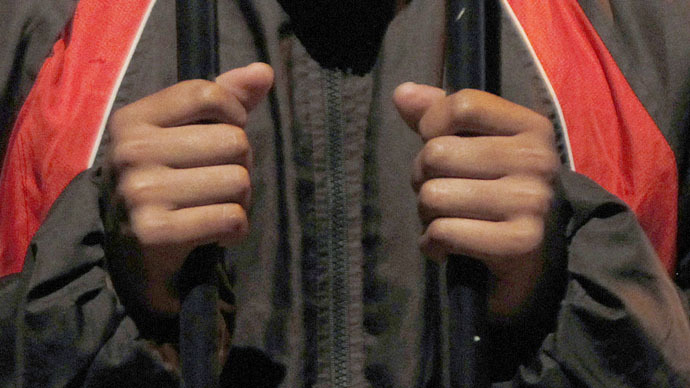 Of all juveniles that are sentenced to life without parole, 97 percent are male, and 60 percent are black, according to a 2012 report by the Sentencing Project. In addition, the rate of blacks serving life for killing a white person is significantly higher than that of whites sentenced to life for killing blacks. In the case Miller v. Alabama in 2012, the US Supreme Court barred mandatory life sentencing without parole for kids under 18, considering the practice cruel and unusual, thus violating the Eighth Amendment. “Mandatory life without parole for a juvenile precludes consideration of his chronological age and its hallmark features — among them, immaturity, impetuosity and failure to appreciate risks and consequences,” Justice Elena Kagan wrote in the court’s opinion. Nevertheless, state-level judges in the US still have leeway when deciding a sentences based on the particulars of the crime. Twelve US states and the District of Columbia have banned life sentences without the possibility of parole for juveniles, according to the Sentencing Project. Two-thirds of children who received life sentences without the possibility of parole were from just five states: Pennsylvania (472), Michigan (356), Florida (355), California (293), and Louisiana (228). For children, being sentenced to life in prison is “a devastating process to even conceptualize,” said Dr. Louis Kraus, chairman of the juvenile justice reform committee at the American Academy of Child and Adolescent Psychiatry. “The toughest part is that the crimes children might have committed, as devastating as they may have been, are really in unformed brains,” Kraus told Al Jazeera.